Grease a 22cm base by 6cm high, loose bottomed quiche pan with butter. Sift flour and add butter. Rub with fingers to form a crumble. Add water and mix with a knife till dough starts to come together. Use hands to shape into a smooth ball. Cover with cling wrap and refrigerate for 30mins. Sauté onion, garlic and bacon till soft. Season with pepper and salt. Allow to cool slightly. Mix together 5 eggs, sour cream, milk, and pepper. Roll out pastry to roughly 5mm thickness. Carefully place into quiche pan, pushing into the sides, making sure there are no cracks. Blind bake the pastry - place non-stick baking paper onto pastry and weigh down with uncooked rice or baking weights. Cook at 180 degrees for 15 minutes. Remove the weights and cook for a further 10 mins. Brush the pastry with the beaten egg to fill any small cracks in the pastry. Return to oven for a further 5 minutes or until pastry is a light golden brown. Allow to cool slightly. Scatter cheese over the base of the quiche. Add the onions and bacon mix evenly. Pour the quiche mix carefully into the dish. Sprinkle the sliced shallots. Bake in the oven for 20 minutes at 200°C. 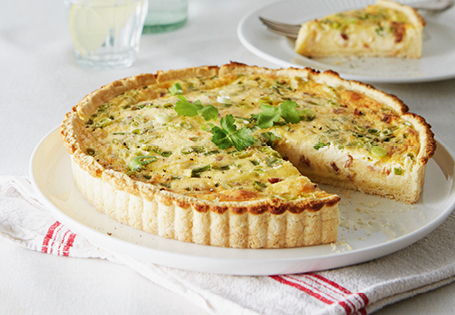 Reduce the heat to 180°C and bake for a further 40 mins till quiche is set in the centre and cooked. Recipe created by Suzanne from the ALDI Test Kitchen.